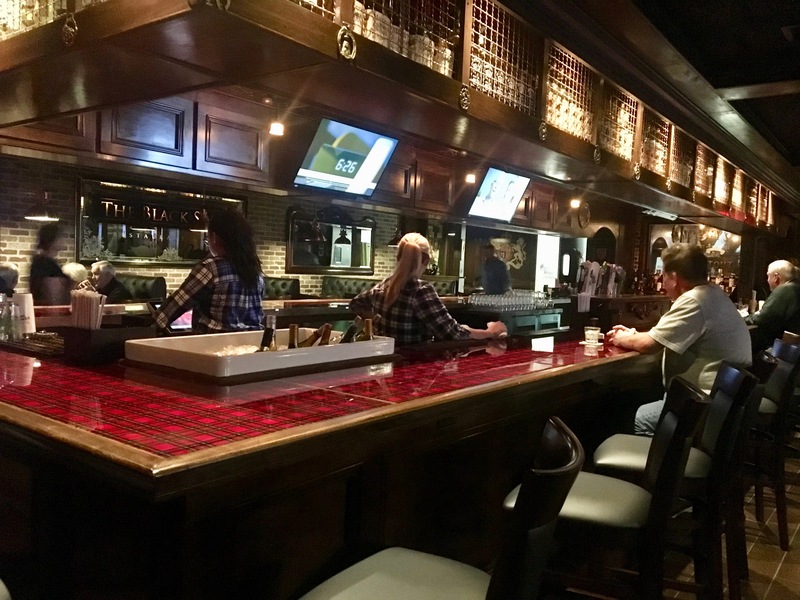 Back in the “old country”, the British pub is a gathering place for the neighborhood. And gather they do, showing up every day after work for a pint of (fortunately) low alcohol beer. Or two or three. 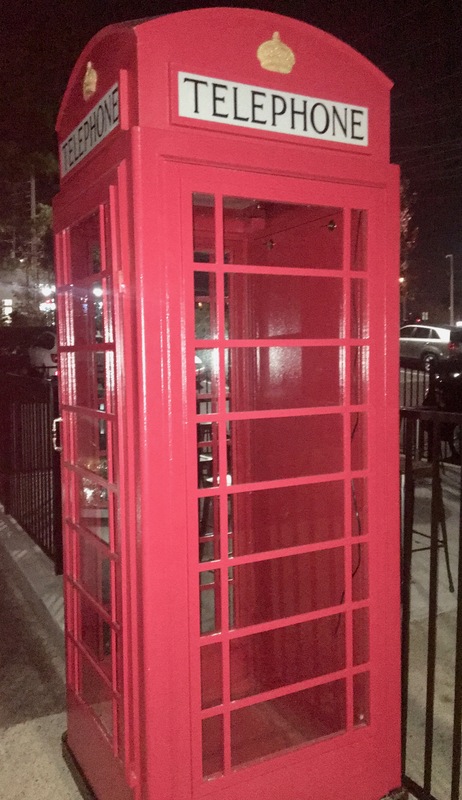 In the colonies, we don’t gather as much as the Brits, but it’s always nice to have a place to hang out in a red phone booth or get an order of fish and chips. There used to be another British pub in this space, but we never went there because they let them smoke inside. We are in one of the endless shopping centers on Johnson Ferry Road in East Cobb. Note the British flag on the Jeep outside. If only it was a Land Rover. 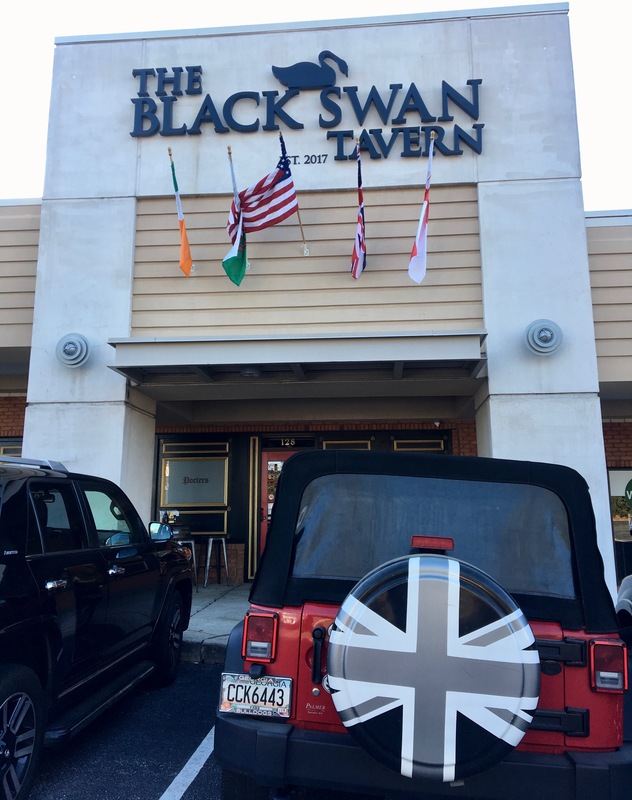 The Black Swan is owned by the Dunwoody Restaurant Group, which now has eight pubs in the area. Should we try all eight? The decor is pure plaid. There’s plaid in the bar, in the carpet, and all of the servers are decked out in it. We feel like we are in an Eddie Bauer catalog. We are here for beer and a light dinner. The beer menu is not too bad, but there is too much mass-produced American beer on it. And mass-produced Irish and English beer. Let’s serve up some suds. 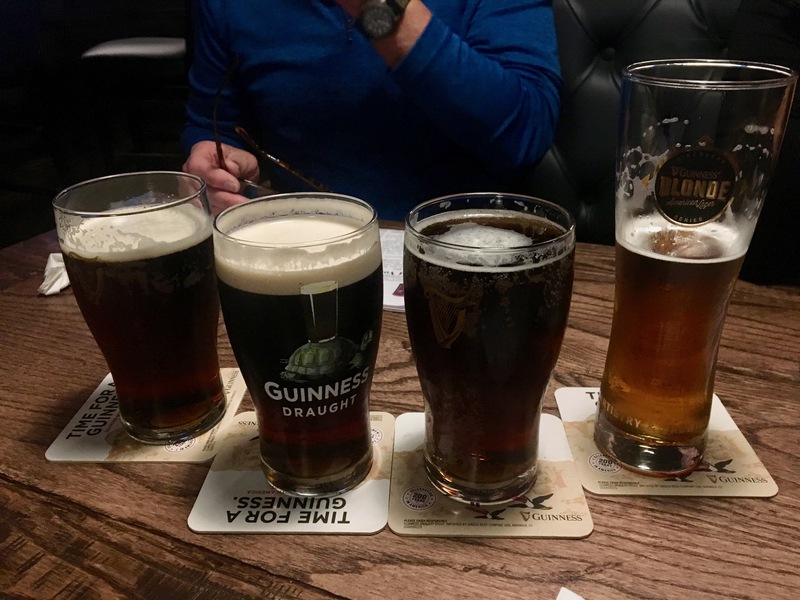 There’s Newcastle, Guinness, and Guinness Blonde, which is made in Pennsylvania. It’s the beer that the Irish think Americans will drink. 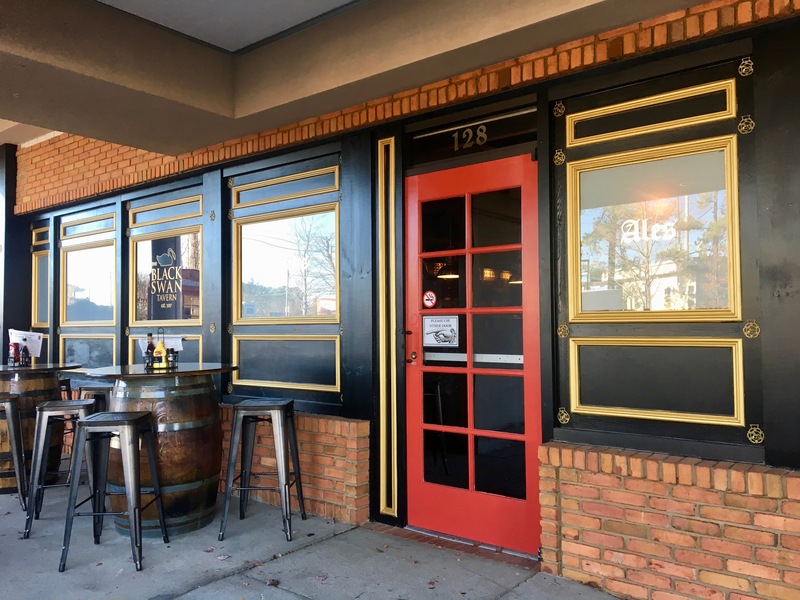 If you notice four glasses instead of two, we are once again joined tonight by East Cobb Dining Society’s Stephanie and Bill, who we like to drag to new restaurants. According to the menu, the appetizers are “savoury”. 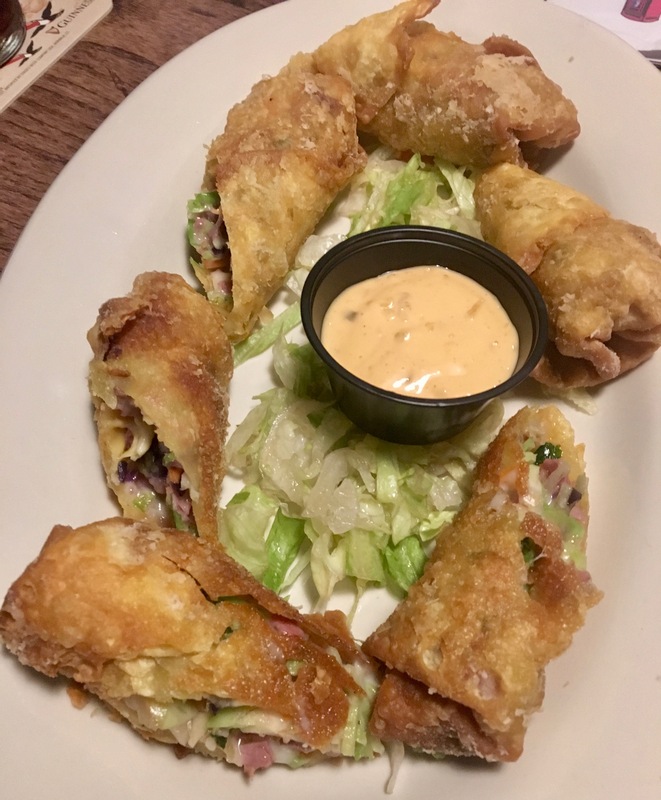 Let’s show a “colour” photo of our first appetizer, the Irish Spring Rolls. We see the pretzel go by and have to order it because Eve really likes her soft pretzels. This one happens to be gigantic. We are happy to report that it tastes as good as it is photogenic. After the filling “savouriness” of the apps, both couples decide to split their entrees. 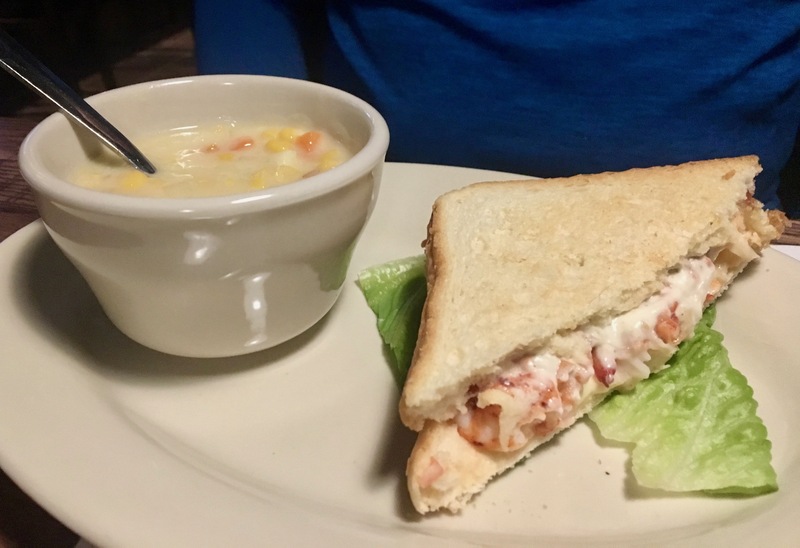 Our dining companions get the lobster grilled cheese (brie and cream cheese) on Texas toast/white bread. There’s nothing more English than Texas toast. This one comes with corn chowder, which is the soup of the day today. The sandwich does not last long, so it must have been enjoyed. Our split is much more appropriate to the setting. 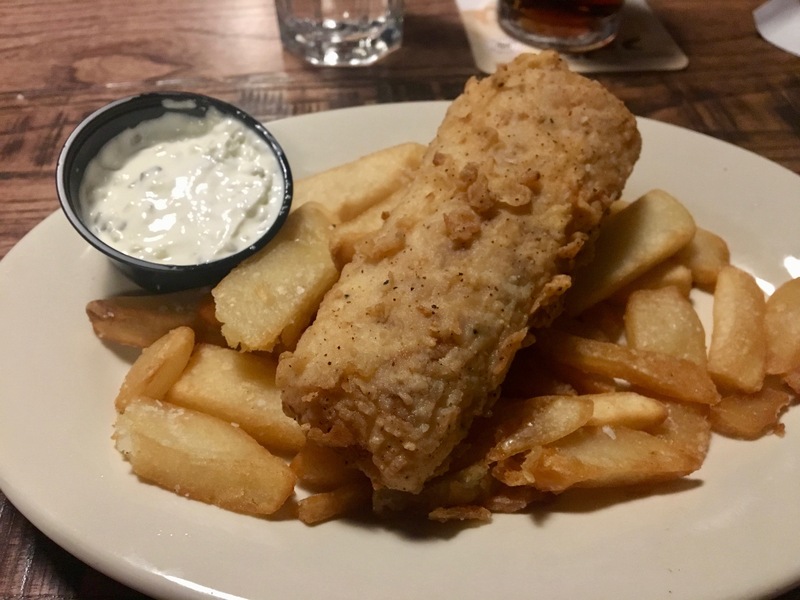 We always judge a pub by their fish and chips. The fish is crispy on the outside and moist on the inside. The chips are a bit limp and we wish they were crispier. 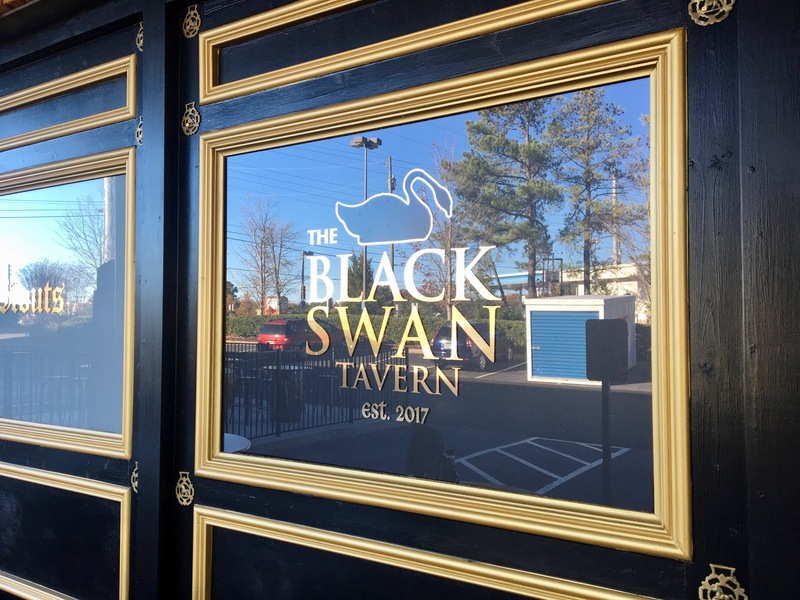 The bottom line on Black Swan Tavern: It’s a nice addition to the East Cobb dining scene. The menu is varied, which means there’s something for everyone. The wood decor reminds us of many pubs we visited in London in 2016. 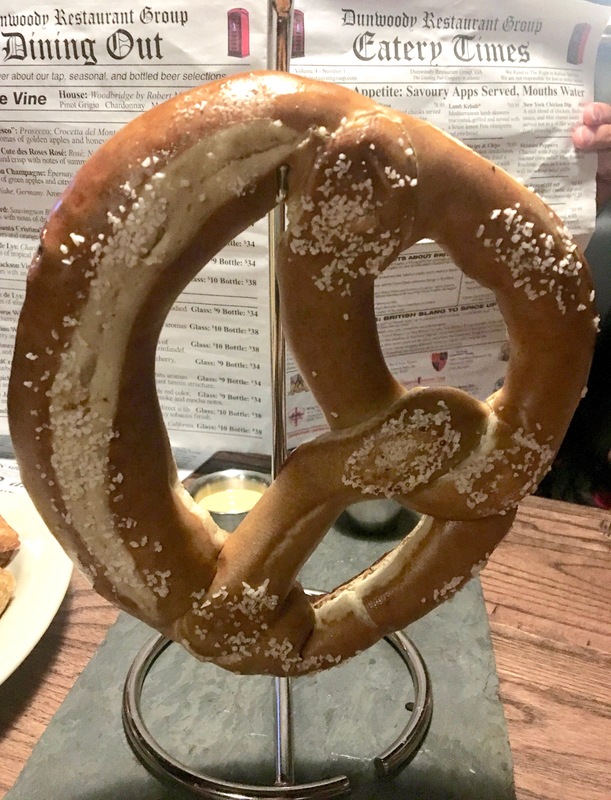 We hope that people come in for a pint and a plate after a long day of work or shopping at the nearby Target. Next Post The Impossible Burger: Where’s the Beef?